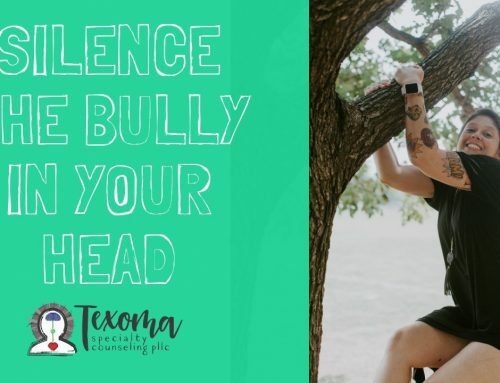 As an eating disorder therapist, body image, self-esteem, and eating disorder recovery coach in Sherman, TX I see a lot individuals that struggle with self-hatred. Recently I was asked, “How can I love myself when that is the last thing I want to do”? That nagging and mean voice in your head can make it really hard to accept yourself and to practice self-compassion. Your eating disorder wants to keep your thoughts negative and hurtful. Remember this is a lie. For most it feels like the thoughts are true. I always say you cannot think something that you do not believe. Therefore whenever the eating disorder thoughts appear you believe they must be true. Keep in mind that your eating disorder causes distorted thinking. This means that your brain takes information and skews it so that it is less accurate and true. It takes information and will either see it inaccurately, or it will focus on the worst possible issue. The eating disorders sole focus is for you to hate yourself, but just because the thought is in your brain does not mean you have to accept it as true. Because your eating disorder is really good at distorting information you can learn to challenge the thoughts that come into your head. This is going to help you shift your focus and learn to better appreciate yourself. If your eating disorder is telling you a lot of negative things about yourself, try journaling the exact opposite and then look at how this is also true. For example, let’s say your ED voice says, “you are stupid. You are such a failure”. The exact opposite is “I am smart. I have been successful”. Then in order to help this new healthy self thought stick write down all the ways you are smart and you are successful. Give yourself examples to help you challenge the hateful eating disorder voice. Your eating disorder wants to convince you that you are the worst person ever by highlighting and shaming you for mistakes you have made. You are human and you are going to make mistakes. Every single person on the planet has screwed up big time and we all feel ashamed and embarrassed when this happens. This is a normal human reaction. You feel the way you do because you are human. You can practice self-compassion by reminding yourself you are human and it is OK to make mistakes. You can feel embarrassed and ashamed and still be understanding and forgiving of yourself. A great way to practice self-compassion is to ask yourself, “If my friend came to me with this problem, what would I say”? The goal is to practice talking to yourself the way you would talk to your friend. Your eating disorder wants to pay attention to your body and it’s imperfections. However when you focus ON your body you miss out on quality time with friends, family, and yourself. You become distracted by what is wrong, instead of being present and aware to notice what is right. When you can focus on being IN your body you turn your attention to your surroundings. Use all your senses to take in who you are with and what you are doing. Being IN your body is how you make memories and learn to enjoy situations. 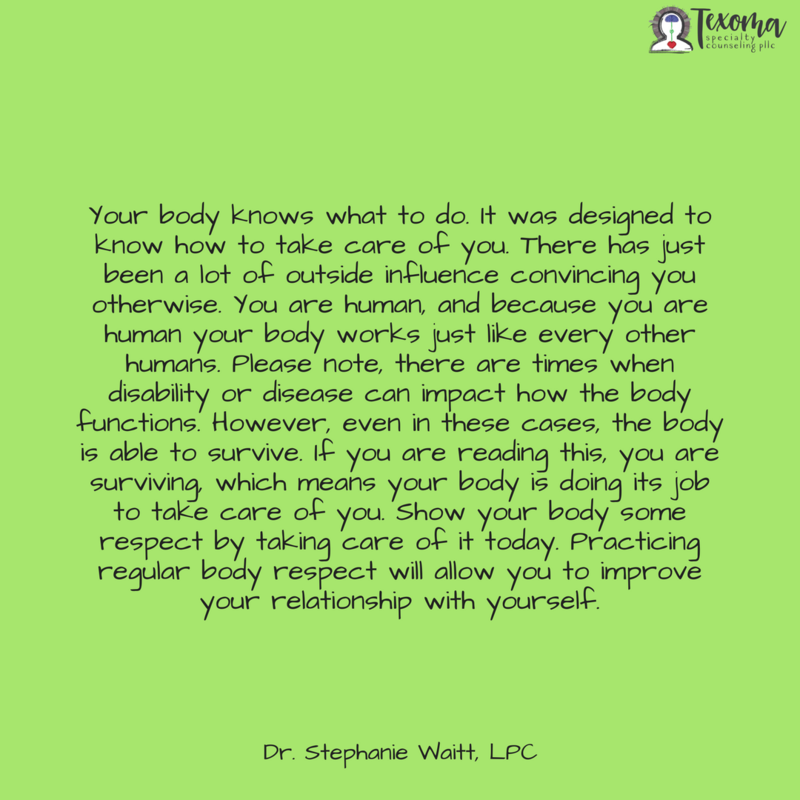 Your body knows what to do. It was designed to know how to take care of you. There has just been a lot of outside influence convincing you otherwise. You are human, and because you are human your body works just like every other humans. Please note, there are times when disability or disease can impact how the body functions. However, even in these cases, the body is able to survive. If you are reading this, you are surviving, which means your body is doing its job to take care of you. Show your body some respect by taking care of it today. Practicing regular body respect will allow you to improve your relationship with yourself. Self-love is a process and a journey. Loving yourself is about learning to accept yourself and having compassion for yourself. It means you know you are imperfect, and that makes you special. 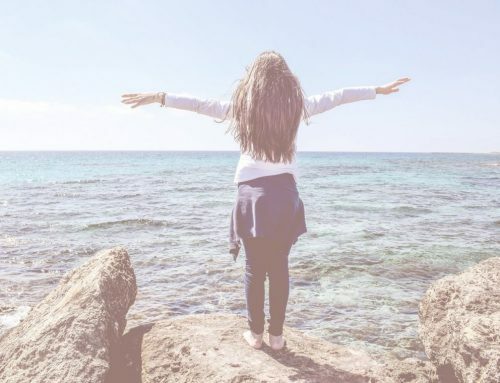 Loving yourself is about giving yourself permission to enjoy life first and that you can start doing that today, without having to make any personal changes. How do you show love, support, and care to others in your life? Today I encourage you to do the same thing for yourself. Practice treating yourself the same way you treat your precious loved one. It may feel really strange at first, but the more you do it, the easier it will get. So let me ask you, how do you plan on loving yourself today? Feel free to contact me with all the ways you plan on loving yourself today. I am stoked to hear from you.